and I am so excited to have the honor of being your hostess at Art Journal Journey this month! Many thanks to Valerie and Susi for the invitation! If you haven't "met" me before, I love maps – their lines, rhythm, movement and patterns. I find inspiration in vintage atlases I collect, fascinated by the antiquated pages and the ideas of time and travel they contain. I chose “MAPS” as the theme for this month, so that we could all do some exploring in our art journal pages! 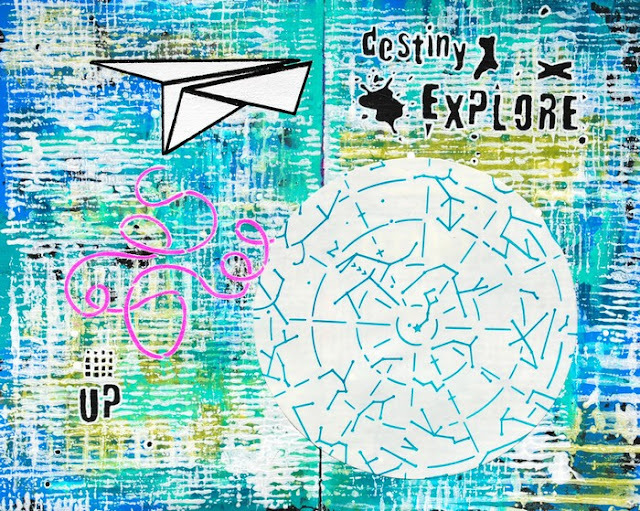 Your art journal pages could contain maps that are real or imaginary, drawn or collaged. Your pages could be about a physical trek outward or personal journey inward, or could be about a favorite place or somewhere you want to visit in your lifetime! Think creative cartography! I had a blast creating these art journal pages containing a paper airplane flying over a map of constellations! I can’t wait to see your art journal pages about MAPS and where they take you this June! ist diesmal unsere Hostess für Juni . Sie ist dafür bekannt mit Landkarten zu arbeiten - besuche ihre Website - falls Du Mary noch nicht kennst! tobe Dich aus und solange Du Dich bitte wie immer an die Mitmachvoraussetzungen hältst und das Thema beachtest, darfst Du soviele Beiträge verlinken wie Du möchtest! Bitte hinterlasse einen Kommentar nach dem Verlinken- danke! Click above button in the course of the month to see all entries at one glance./ Klick einfach obigen Galerie-Knopf um im Laufe des Monats sämtliche Beiträge auf einen Blick zu sehen. A wonderful theme and example Mary! We all will have much fun this month I guess! Hello Mary, nice to meet you. Your theme "Maps" sounds intriguing and your artwork sample is inspiring. I like the paper aeroplane going on its celestial journey. Delighted to be this months hostess! Thank you Valerie and Susi! It's going to be a fun month of maps! Hi Mary! So excited to learn about this challenge and that you are hosting this month! Such a fun and inspiring theme! Hello, Mary! I love your map page. It expresses the idea of the journey so very well! Thanks for visiting Marmelade Gypsy and welcoming me. What lovely things I am discovering today! Wonderful map page in a very own special style. Thank you for our new theme. Hello Mary, this is a super theme and fantastic inspiration pages. I like this blue, the theme, and the pink curved line! Those leaving a comment on any post on this blog do so in the knowledge that their name and blog link are visible to all who visit this blog and by providing the comment, they have published their own personal details on this blog .